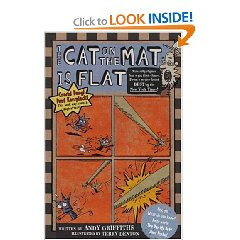 I recently saw a review about The Cat on the Mat is Flat by Andy Griffiths at books4yourkids, and I thought the book would be perfect for C. It is written for early readers, but it is packaged to look like a chapter book for older kids. I admit when I saw it, I was worried it would be too advanced for C, who is in kindergarten. I figured I could at least read it to him if that were the case. But then he started reading the first story, and he did great! Each story in the book is written to focus on one specific ending. For example, the first story is The Cat, the Mat, the Rat and the Baseball Bat. Obviously, it features a lot of words with the -at ending. The next chapter focuses on -ed words, and so on. The best part of the book, though, is that it's fun to read! C is getting to the point where books that are at his level are getting longer. And it's a struggle to get him to read an entire book because he's honestly bored with the story and doesn't care about reading it to the end - even if he can technically read the words. But The Cat on the Mat is Flat is a fun book. I actually laugh out loud at some of the things that happen and he's having a blast reading it. He's only made it through the first two stories, and it will be due back to the library in another week. So I'm seriously considering purchasing this one. I think this is a book that he will go back to as he becomes more confident in reading. The stories are interesting enough that he will likely want to read them over and over again. I highly recommend this for young elementary kids who are reading at a first grade level or higher, especially kids who like funny stories with a bit of slapstick humor. This review was written based on a copy of The Cat on the Mat is Flat that I borrowed from the library. That sounds like a great book. I'll have to see if I can find it.